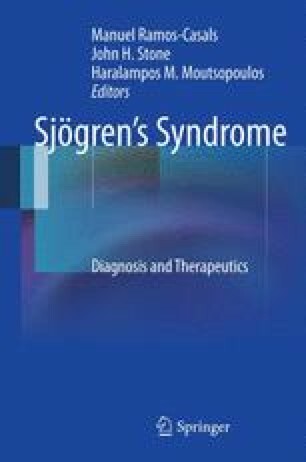 Sjögren’s syndrome (SjS) is an ideal model for dissecting the pathogenetic aspects of autoimmune disorders because the affected organs, the labial minor salivary glands, are easily accessible with minimal morbidity to the patient, and patient’s sera are rich with autoantibodies directed against organ-specific and non-organ specific antigens. Two major biologic phenomena underlie the autoimmune nature of SjS: (1) the peri-epithelial lymphocytic infiltration of the affected tissues; and (2) B lymphocyte hyperreactivity. Several studies in the past several years have pointed to the central role of the epithelial cell in the pathogenesis of the disease, suggesting that the condition, in effect, is an “autoimmune epithelitis” . The importance of B cell hyperreactivity is demonstrated by the presence of hypergammaglobulinemia and the large array of autoantibodies associated with SjS.